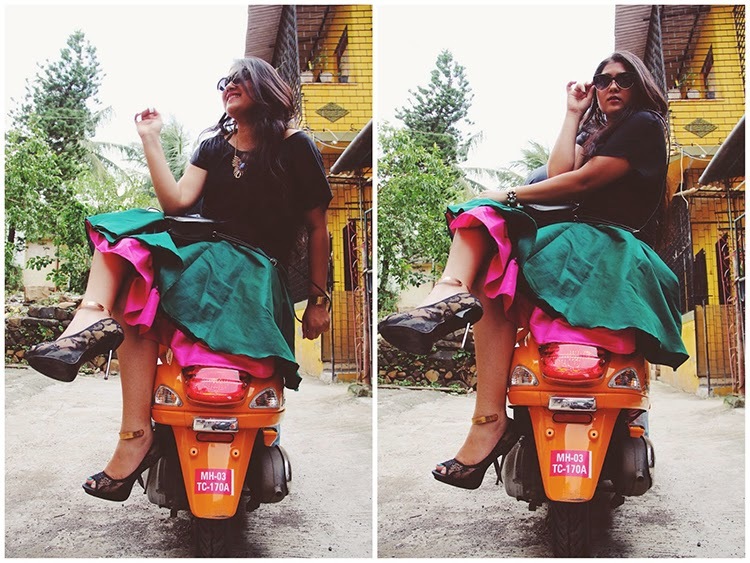 When BlogAdda asked me what I would do if they gave me a Vespa for a few days, I told them without any hesitation, I would learn to ride it (I was just trying to be funny at that time) however they seemed to actually like the idea, and actually decided to give me a bike for a while. And that's how it all began. Here's what you need to know about me, I'm terrified of riding/driving and I don't have a license as well. Because of this phobia, I've never even tried to learn riding, although I did try my hands on driving, but gave up after a few weeks. The Vespa loomed towards me like some sort of temptation. I've always associated Vespas with Italian culture and in my mind I have images of riding along, on the streets of Rome and being very tourist-y (thank you very much Audrey Hepburn). The closest I've been to that fantasy is riding pillion on a red Vespa on the streets of Milan, but that's still closer than most others. So I braced myself and said yes to this fun and thrilling collaboration. So what exactly did someone like me, who's a non-rider, do with the bike? Take pretty posy pictures on it? Well yes, I did (welcome to the #LifeOfAFashionBlogger). But only a few. However most importantly, I learnt how to ride it. Yes it doesn't matter if I can cover only a distance of 50 metres before I freak out, at the end of the day I did manage to ride it. For a bit. While I didn't exactly ride it at all times, since I don't have a license, and I'd rather not risk unleashing myself on the streets, because it's against the law, and it's not safe for me or others around me, I did manage to plan and execute a lot of shoots. With the bike, it was easier to go around and scout for locations, and for once we actually stepped out of Kalina, which just was a safe space for all of us, and eventually made us lazy when it came to shooting outfit posts. With the bike, this excitement bloomed each morning, as we asked each other, where do we go shoot today? Also when it comes to my style and outfit posts, I'm really particular about my background. I need something pretty or even remotely nice before I start shooting, and I prefer everything outdoor. So we dodged the rains, and sought clearer skies in a few parts of the city, all aided by this bike. One confession I have to make is that I found my Vespa really handy when to came to dumping my shoes and bag in the storage box. Sadly the streets of Mumbai are not that great, and I prefer wearing my heels when I reach my destination to avoid damaging the shoes or getting a nasty ankle sprain. Another exciting thing we did was shoot a video with the bike. With all the local locations we sought out, and with our new camera, we just couldn't resist. So stay tuned for that video, which will be out soon. What I learnt while this bike was in my possession.. The Vespa is a fun bike. A lot of folks told me I was lucky to learn how to ride on a Vespa. People stare, a lot. Especially when you're riding on a bright orange bike. You know that saying 'People will stare, make it worth their while'? well I tried my best not to disappoint. Cops are always drawn to orange things with wheels. We were stopped multiple times on different days and once we even got towed! We were at the Bandra Fort and out of the scores of bikes parked there, only the Vespa was taken away! Sitting with a maxi dress or any other dress for that matter is a really tough, however it's still possible. You just need to practice mounting and dismounting without drawing unnecessary attention. It's surprising how all my clothes seemed to work well with the colour of the bike. I had a lot of reservations about such a strong colour. It's never a good idea to learn how to ride in heels or even flip flops. There's a certain kind of serenity while riding from reclamation towards the sea-link with the wind on your face and your hair flying all around the place that cannot be explained, but only experienced. Love your wedges and the shot with your floral maxi. The orange vespa is much of a chameleon!